This event is sponsored in part by the Washington State Department of Social and Health Services, Aging and Long-Term Support Administration Services and the Northwest LGBT Senior Care Providers Network. 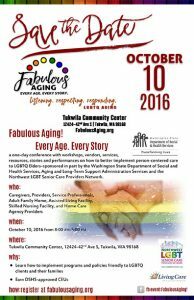 The Fabulous Aging: Every Age, Every Story Conference Planning Committee is pleased to invite you to this year’s LGBTQ Elder Conference. The theme of this conference is, “Listening. Respecting. Responding. LGBTQ Aging”. This collaborative event is designed to raise awareness of the needs of the LGBTQ aging population and improve services and supports. Health and services disparities are documented for LGBTQ elders and amplified for elders of color, disability, social class, etc. and this conference is intended to address equity, diversity and inclusivity of the LGBTQ elder community. The intended audience is Adult Family Home, Assisted Living Facility, Skilled Nursing Facility, Home Care Agency Providers, Trainers, Professionals and Caregivers.